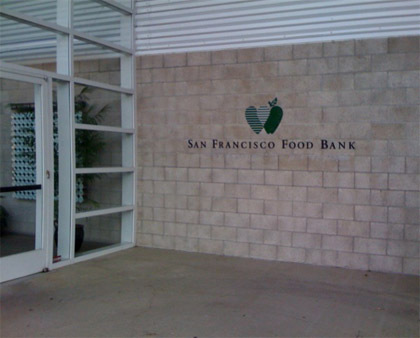 San Francisco Food Bank | Ooh, my favorite! I had a blast volunteering at the food bank warehouse last week. The volunteer coordinators, our group leader, and everyone there were all so fun. I’m already signed up for my next day later this week! I was assigned with a group of Gap Inc. employees, so there were about 10 of us volunteering, and an additional 10 who were employees. Our task for our shift was to sort and pack oranges. To save money, some of the goods are received in bulk pallets and have to be re-packaged for delivery throughout the city. 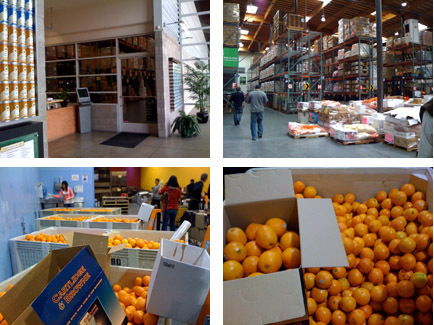 These oranges were donated because they didn’t fit the bill for supermarket selling–mostly for cosmetic reasons. Anything that wasn’t able to be consumed was tossed into a bin where it’d be taken and used as food on a pig farm. In three hours we were able to pack and move 15,000 pounds of oranges that will go on to help feed about 78,000 people a day. Sadly, our group leader, Will, told me that a majority of the fruit will go to school lunch programs for underprivileged kids, and in many cases it may be the only piece of fruit they have all week. I definitely look at oranges (and all of my fresh fruits and veggies) with a different appreciation. Thanks so much to Sandhya at Livin Wide for organizing her Blog It On event. What a great idea! Thanks for volunteering and blogging about your good experience! We so appreciate all your work – and you can bet some very happy kids will enjoy those oranges. I had so much fun! Wow, $4 a day on the Hunger Challenge, I’ll definitely mark it on my calendar. I would love to try this out. Thank you for volunteering at the San Francisco Food bank! Thank you so much, I had a great time. Thanks to you guys for running such a wonderful program.